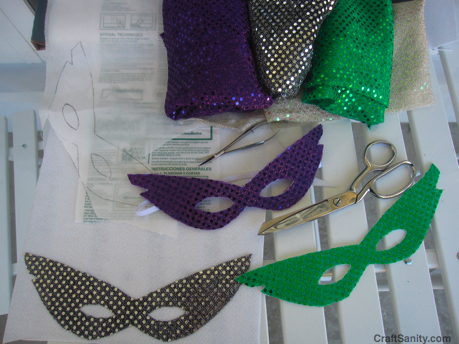 Halloween is coming up, so I whipped up some easy superhero masks to add to our costume stash. 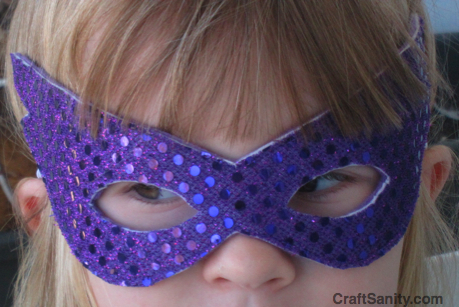 The fun thing about these masks is that many kids like to pretend they’re superheros all year round. So, you can get quite a bit of millage out of these which is an added bonus. * Printed mask template. Draw your own or download the pdf of the design I used here. Note that one of my templates was adapted from a design I found on this site. I also included a smaller mask of my own design. ****UPDATE: My templete link is broken and the site I referenced above no longer features the template that inspired mine. My apologies! I will try to make a new template when time allows. Step 1: Print and cut out the template, and trace onto the paper side of Wonder-Under. Step 2: Cut the mask shape out of the Wonder-Under and hold up to you eyes to see if you need to adjust the eye holes. Once you’re happy with your design, iron the mask sticky side down to back of metallic fabric. Cut out the shape again. Step 3: Peel paper off the back of the mask and iron back side to thick piece of interfacing. Cut out again. Step 4: Iron back side to another piece of Wonder-Under. Cut and peel off paper backing. Step 5: Iron back side of mask to piece of coordinating craft felt. Cut out shape. Step 6: Pin elastic piece to each side of the mask and machine sew around the edge of the mask to secure the elastic in place. Step 7: Put on your mask and pretend you are a superhero. Alternate Mask: To make the smaller, rounded off mask on the pdf, use the smaller template on the pdf. Cut two mask shapes out of pieces of craft felt and fuse together using double-sized Wonder-Under. Tuck the elastic between the layers on each end and sew around the edge to secure the elastic in place. Here’s the demo I did during my “Take Five” segment on WZZM channel 13… My apologies to jewelry artist Lisa Lehmann for botching her name during my column preview. I was very pleased to locate this web-site. I wanted to thanks for your time for this great read!! I unquestionably enjoying just about every little bit of it and I’ve you bookmarked to take a look at new stuff you blog post.